On 27 April 2018, the Finnish Defence Forces' Logistics Command sent a Request for Quotation (RFQ) concerning the HX Fighter Programme to the governments of Great Britain, France, Sweden and the United States to be forwarded to the five companies who responded to the requests for information. They were requested to give a quotation on the following aircraft: Boeing F/A-18 Super Hornet (United States), Dassault Rafale (France), Eurofighter Typhoon (Great Britain), Lockheed Martin F-35 (United States) and Saab Gripen (Sweden). The Finnish Government’s Defence Policy Report and a number of Finnish defence administration plans set out the guidelines for the RFQ. The Government’s Ministerial Committee on Economic Policy endorsed the Programme, and Defence Minister Jussi Niinistö authorised the Finnish Defence Forces' Logistics Command to submit the RFQ. 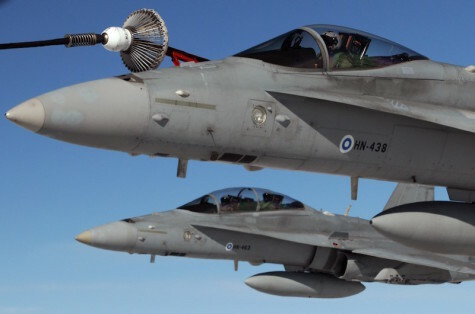 The aim of the HX Fighter Programme is to replace the operational capability of the Finnish Air Force’s Hornet fleet that is to be phased out as from 2025. The Programme is tasked to define, on the basis of the available resources, the best possible military capability and bring the maximum added value to the entire defence system. The desired capability has been defined, and based on this an entire procurement package will be negotiated and built around each multi-role fighter option. The package contains 64 aircraft along with the technical systems, training systems, maintenance tools, testing equipment and spare parts as well as weapons, sensors and other type-specific support functions. To reduce the risk involved in the integration of different systems, the tenderers are requested to provide comprehensive solutions meeting the operational requirements. Each tenderer is responsible, together with its government, for the complete package including effective weapons, sensors and special systems, system integration and mission support systems. The Decision-making model and Evaluation will be based on the following decision-making areas: Military Capability, Security of Supply, Industrial Participation, Affordability, and Security and Defence policy assessment. The procurement will have an impact on the Finnish Defence Forces’ operations and on the Finnish Air Force’s combat capability until 2060. The selected system should offer the best capabilities, supporting elements and capacity for further development for the entire life cycle. The military capability assessment will be made using five scenarios: Counter-Air, Counter-Land, Counter-Sea, Intelligence, Surveillance and Reconnaissance (ISR) and Long-Range Strike. The candidates’ capability to adapt to the Air Force’s agile combat support at different types of operating bases in dispersed locations will also be assessed. The tenderer shall provide an industrial cooperation and in-country security of supply solution to enable wartime operations. The operating and maintenance costs of the selected system shall be covered with the defence budget. Military Capability is the only decision-making area where the candidates will be compared. The other areas are assessed as pass/fail. Defence and security policy will be assessed separately. In the RFQ phase, the tenderers will provide binding information on the solutions, to be assessed by the HX Fighter Programme. The procurement procedure is divided into several phases. The RFQ that was now sent starts the first phase of negotiations, during which the preliminary candidate-specific procurement packages will be determined. The next phase will commence in the second half of 2019. During this phase, the final contents of the procurement packages will be negotiated and determined with each tenderer. The final quotations will be requested in 2020, at the end of the second negotiating phase. The Finnish Government will decide on the procurement in 2021. The HX Fighter Programme aims to negotiate the best possible solution with each tenderer. Defence Minister Jussi Niinistö has decided on an industrial participation obligation for the HX Fighter Programme: The HX Programme includes an obligation to the tenderers for industrial participation at a minimum of 30 per cent of the total contract value. This will be sufficient to ensure the domestic industry’s significant involvement, ensure sufficient security of supply and reinforce Finland’s defence technological and industrial foundations.